The national Ministry of Housing and Urban/Rural Development issued two sets of technical guidelines relevant to station areas: Guidelines for the Planning and Design of Urban Pedestrian and Bicycle Transportation Systems (2013) and Guidelines for the Planning of Urban Parking Facilities (2015). Provision 11.1.1 of the Pedestrian and Bicycle guidelines requires that the roadway and intersection designs within 600 metres of a transit station be optimized for pedestrian and bicycle access to the station. Provision 5.6.2 of the Urban Parking guidelines states that parking facilities in transit station areas should be reduced and parking maximums should be applied in transit station areas and city centres. This article considers international and national best practices in these areas and proposes how they can be applied as part of the BRT implementation in Ji'an. Typically, a Transit-Oriented Development has superior access to transit. As such, residents and businesses in this area have been given a special privilege of having far better transit services than those residents and businesses in other locations. Because this superior public service is being provided, however, the expectation is that properties in such locations should not generate as much private motor vehicle traffic as residences and properties in other locations. This makes it possible in these locations to minimize the amount of land within the zone dedicated to roads and parking facilities. The TOD Standard (p.92 & 93) gives 15 out of 100 points for minimizing the land occupied by motor vehicles; namely for parking and roads. Specifically, it awards 8 points for minimizing the percentage of land area dedicated to off street parking; 6 points for minimizing the percentage of land area dedicated to public roads and on-street parking; and 1 point for minimizing the number of access points to off-street garages. Internationally, it is increasingly common for zoning regulations to reduce the minimum parking requirements or even replace parking minimums with parking maximums in certain areas of the city, such as in transit station areas and in downtowns which tend to have multiple transit services. Most of Central and Lower Manhattan in New York City, for instance, has a parking maximum of 0.2 units per residential unit. Central Boston abolished parking minimums for commercial developments. Many European cities have gone even farther, establishing a cap on the total units of parking in the central zone to limit traffic to levels the existing street system can handle. Zurich, for instance, set a parking cap in the city center which meant that no additional units of parking can be built in the central area of the city. Chinese cities exclusive of Hong Kong (which has very low parking requirements, at 0.05 units per 100m2 of residential area within transit station areas), have parking requirements ranging from 0.3 (Shanghai) to 2.0 (non-central areas of Jinan). Several Chinese cities reduce the parking requirement for transit station areas. Shanghai allows the minimum parking requirement to be reduced by 20% if the development is within 300 meters of a mass transit station (provision 6.3.3. of the Technical Guidelines for Detailed Regulatory Planning, Shanghai). Shenzhen has implemented the first parking maximum (cap) in the mainland, allowing for up to 80% of the parking minimum in areas within 500m of metro stations. This level of 80% of the parking minimum is changed to a maximum, with anything from zero up to the parking cap permitted, though in an interview with Far East Mobility on 19 September 2017 the Shenzhen Urban Planning & Land Resource Center explained that developers had not yet taken advantage of the opporutunity to provide developments with no parking. Shenzhen also has relatively low parking requirements in many conditions (0.3/100m2 residential area) in areas designated as ‘commercial activity centers’. Nanning also stipulates a 20% reduction in off-street parking requirements if within 500 metres of a mass transit station, with specific reductions allowed for various commercial developments. Nanjing allows a 15% reduction in the parking minimum within 500 metres of a transit station. 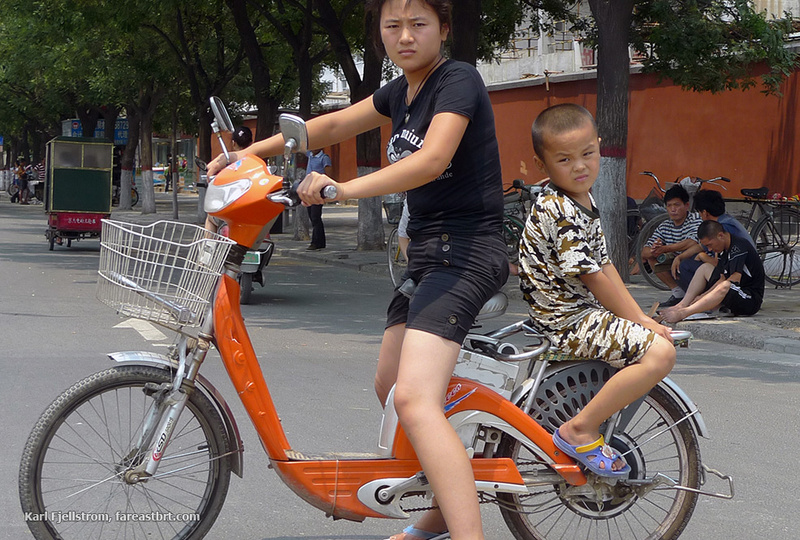 Beijing has significantly lower parking minimums in the old city. These reductions in parking requirements are modest by international standards. Ji’an follows the parking requirements of Jiangxi Province. These guidelines break down based on the number of square metres in the apartment. An apartment between 90m2 and 140m2 is required to have 1 parking space for a car and 0.5 parking spaces for a bicycle. Smaller apartments of less than 50m2 up to 90m2 are required to have 0.5 parking spaces per housing unit, and 1 bicycle parking space. The car parking space must be 25m2 and the bicycle parking space 1.5m2. Cities with less than 20,000 people can reduce these requirements by 20%. There is currently no discount for transit station areas as there are not currently transit station areas. Some cities have special zoning requirements for transit station areas that make it easier for pedestrians to walk to the station from a wider radius of surrounding properties. Because people tend to walk to transit stations, and as they walk much slower than a person can drive a car, it is important that they can walk as directly as possible to the station, as any divergence in the directness of their route translates into significant additional delays. To ensure people can walk as directly as possible to the station, public walkways should be as close together as possible. The TOD Standard awards 15 out of 100 points for creating a dense network of streets around the transit station and additional points if there are more non-motorized pathways than motorized pathways. In Ji'an, large blocks in new development areas are often more than 10 hectares in area. The highrise residential development immediately east of the Municipal Government building has an area of 12 hectares, and would need to be broken up into six separate blocks to comply with the Shanghai standard. The Ji'an high-speed rail station area planning includes some provision for breaking up the large blocks into smaller blocks for pedestrians, as seen in the orange lines below from the Regulatory Detailed Planning of Ji'an High Speed Rail Station Area (Draft). Pedestrian and transit networks, with large blocks broken up into smaller blocks for pedestrians in the Ji'an high speed rail station area planning. Source: Regulatory Detailed Planning of Ji'an High Speed Rail Station Area (Draft), 2017. In Ji’an in the newly developing parts of the city including along the BRT corridor, the block sizes vary from the smallest block being about 200 metres by 200 metres (4 hectares) which is more typical in the city centre, to the largest blocks being about 500 metres by 500 metres square (25 hectares) in the newer parts of the city. Many of these are super-blocks to which gates could simply be added to the perimeter fence to face the BRT corridor. For instance, in the development immediately east of the Municipal Government Building, the perimeter fence around the complex is roughly 850 metres long. A resident of a tower immediately adjacent to the planned BRT station will need to walk 370 metres compared to a straight-line distance of 50 metres. At a walking speed of 1 metre per second, this means that the lack of pedestrian access or a gateway imposes a 6 minute walk to the BRT station on potential passengers which would take less than one minute if there was a gate on the street facing the BRT station. The additional 5.3 minutes in walking time will deter many passengers. The problem of detours around large blocks is also felt by people coming from blocks back from the BRT corridor, as shown below, where a person exiting the east gate of the large housing development adjacent to the City Government Building would need to walk an additional 541 metres to access the BRT station compared to a direct walk through the superblock of only 300 metres. The additional 240 metres in walking distance imposes an additional 4 minutes on a trip to access the BRT station. The problems of additional walking distances imposed on people accessing BRT stations is exacerbated by the poor conditions for pedestrians, who must walk along lifeless streets facing onto walled superblocks. Detour factors and level of service. Detour factors refer to the actual walking distance divided by a direct measured distance, and are a useful way of approaching pedestrian access to BRT stations. BRT station areas should aim for detour factors of less than 1.3, corresponding to an 'A' or 'B' level of service. The approach needed for new areas is to ensure a dense enough pedestrian and bicycle network such that large detour factors are not imposed on cyclists and especially pedestrians. This can be achieved with superblocks provided there is a finer grid of public pedestrian paths through the superblocks, which is the concept approach taken in many superblocks in the planned high-speed rail development zone in Ji'an. In areas which are already built up, the solution is for the government to either persuade or require provision of access through the superblocks, with gateways installed at points facing the BRT stations. In practice, since it benefits residents, these steps will be taken by some developers or propery managers without requiring government intervention. Super-block residential development along Ji'an BRT corridor with a 245 metre fenced perimeter facing the BRT corridor. Residents must spend an extra 5 minutes to reach the planned BRT station because there is no gate onto the BRT corridor. The detour factor is 7.42, or level of service F. Pedestrians from rear blocks who could otherwise walk through the BRT corridor facing block are forced to walk additional distances to go around the block. In the example shown, the detour factor is 1.81, or level of service E With direct access through the superblock, both would have level of service A. The BRT station platforms are marked in maroon, with pedestrian crossings in white. Residents of superblocks often like the fact that there is a large secure gated area for their children to play, and indeed many compounds have nice playgrounds where children can play without a lot of worry. However, the area occupied by the playground is generally 800m2 or less of the entire compound, which could be easily accommodated within smaller block sizes. A comfortable and shady environment for pedestrians (1 point). 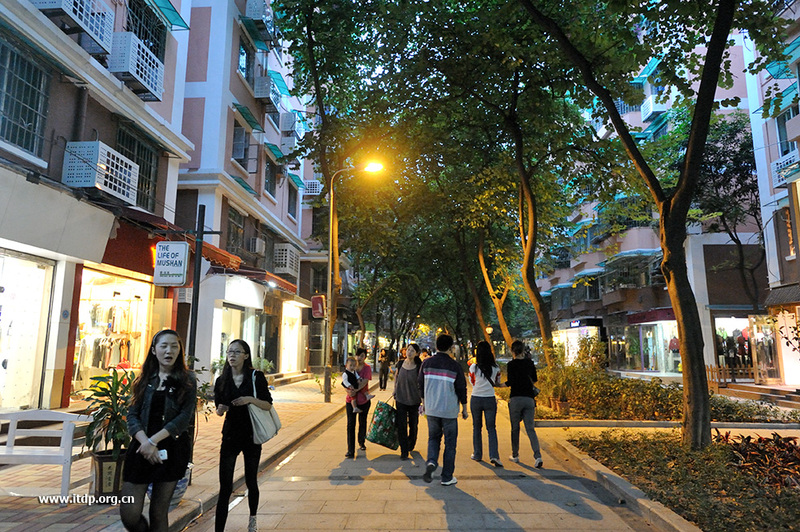 Most Chinese cities do well with the walking environment in the urban core, creating beautiful tree-lined walkways. Most of these areas were built under older zoning codes. The new areas of the city built under current zoning codes often have beautiful greenery but have inactive street facades. Bicycle lanes, which used to be standard procedure, disappeared for a while, and now are re-emerging. Ji’an is no exception. Downtown areas have beautiful tree-lined bicycle and e-bike lanes and walkways with active commercial frontage onto the public right of way. ... and active commercial frontages in older areas. In the newly developed areas, however, where the most recent zoning codes are more tightly enforced, the streetscape is far less active. Typical Ji'an streetscape under the new zoning regulations. Active storefronts in the city center give way to lifeless setbacks further out, often filled with surface parking lots. This is an urban form that assumes that people are driving, and results in a lifeless and uninspiring walking environment in comparison to the city center. This streetscape is also a result of setback and building spacing provisions, the intention of which were to ensure that new housing gets plenty of light and air. These zoning codes are typical of zoning codes in the United States and other Western countries inspired by the internationalist style articulated by the French architect Le Corbusier. It was first codified in New York City with the 1961 Zoning Resolution. Before 1961, New York City zoning was still dominated by the 1916 Zoning Ordinance that first established the ‘setback’ requirements to allow light to reach both the street and the apartments and offices in the buildings. Before the 1916 Zoning Ordinance, even very tall buildings could be built directly up against one-another so that a majority of the rooms inside the building had only limited access to sunlight. These buildings still remain and are known as ‘Old Law Tenements’ meaning they were built before the 1916 Zoning Ordinance. The 1916 Ordinance set limits on the height of the front façade, but allowed upper floors to rise to higher levels at angles that allowed a certain minimum amount of daylight to hit the street. Setback provisions in the 1916 Zoning Ordinance, and a view of the continuous streetfront in New York City in 2014. Building resulting from New York 1961 Zoning Resolution. The 1916 Ordinance, however, always maintained the street wall. The setback was not at ground-level, it only began at the top of the front façade. This ensured that the street façade was maintained, but did not restrict the height of buildings, the mass of the structures, or the lot coverage. This changed in the 1961 Zoning Resolution which introduced the concept of the ‘height factor building’. It put controls on lot coverage, height, building mass (floor – area ratios). While it did not require the building to be set back, many buildings were designed with setbacks in order to comply with the required open space ratios. The requirements often meant that the building was set back from the street, interrupting the street wall. The 1961 Zoning Resolution was criticized for ignoring the character of certain neighborhoods and allowing the construction of skyscrapers in otherwise low-rise neighborhoods so long as there was a sufficient setback. While the 1961 Zoning Resolution is still the basic legal zoning code in New York City, it has been modified several times, most critically in 1987 when the Quality Housing Program was established. Special zoning designations were created where the Quality Housing Program applied. This program defines that the building needs to be built to the ‘red line’ or the edge of the property line on certain streets to maintain the street wall. It also regulated the height of the building and the maximum height of the base of the building so that a developer cannot build a skyscraper in what has historically been a low-rise residential neighborhood (like Greenwich Village). Example of a parking garage wrapped by retail to preserve the liveliness of the street. 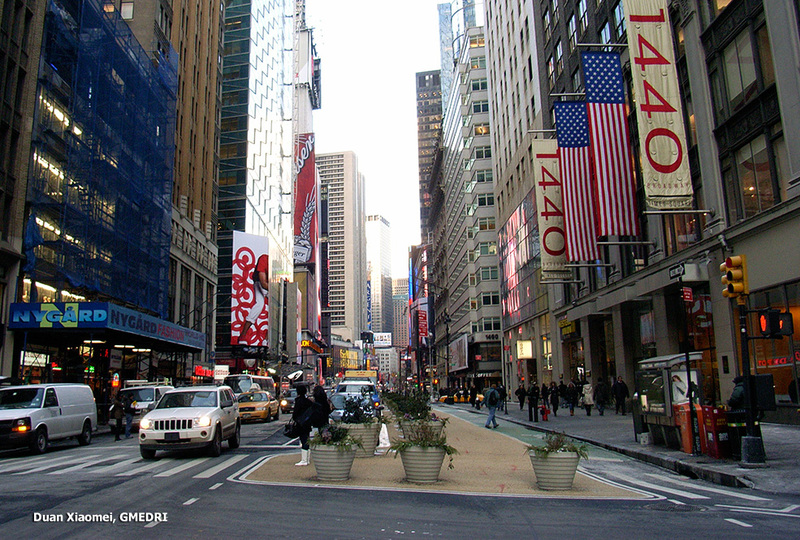 For ‘primary commercial streets’ in New York there are further ‘context’ specific provisions. 50% of the ground-level of the buildings must have transparent surfaces (shop windows) and security gates are not allowed for night. Furthermore, parking garages cannot front onto a primary commercial street: rather, they must be surrounded by at least 30 feet (around 10m) of depth of an allowable land use. Overlay of 'contextual planning districts' allowed New York City to modify only parts of the 1961 Zoning Resolution rather than rewrite the entire code. The lot coverage is regulated, but it can be as high as 80%, or even 100% in downtown areas. All the context zoning codes require building to the ‘red-line’ so there is zero setback in the front of the building. In the rear of the building there is a setback requirement. Other cities developed entirely new zoning codes which went even further, defining the type of buildings and general look desired for specific neighborhoods. The base zoning codes in China are similar to the codes brought into effect in most US cities in the early 1960s, though unlike in many US cities, they have been little modified since. Similar to Western cities, however, many Chinese cities have developed special districts where deviations from the base code are required, and in some cases more detailed local zoning has been developed that overrides the less detailed zoning done at the municipal level or provincial level. In Jiangxi Province, there are detailed codes which stipulate how far a building needs to be set back from the ‘red line’ or property line both to the front of the building and the side of the building. The codes also stipulate how far the building needs to be set back from the next building. For taller residential buildings (10 storeys or more), for instance, the building needs to be set back from the property line by 15 metres from the building’s main orientation and 9 metres from its secondary orientation. Example of Jiangxi Provincial code building setback requirements, showing minimum setbacks from the property line. Example of Jiangxi Province city road setback requirements, showing the setback of the vehicle roadway pavement from the edge of the property line. In addition, the property line must be set back from the edge of the e-bike or motor vehicle roadway for a wide primary arterial in a new area by as 18 metres for large buildings, and by 12 metres in the old city. The combined minimum distance from the edge of the motor vehicle or e-bike lane to the front of the building in a new development district is therefore very large, 15 metres plus 18m, or a total of 33 metres. If the roadway has eight 3.5m traffic lanes plus a 2.5m landscaping strip on each side between the traffic and e-bike lanes plus a 4m wide e-bike lane on each side, the total wall-to-wall width is a minimum 106 metres. This 100m wall-to-wall spacing is exactly what is currently being implemented along the newly developing parts of the BRT corridor in Ji'an. Setback requirements result in wall-to-wall spacing of more than 100m and create an extremely unappealing pedestrian environment. This aerial and street level view shows the same location along the Ji'an BRT corridor, in the new development area centred on the municipal government administration area. The result of these setback requirements is that the street wall is frequently interrupted by set-back buildings. As the use of this set-back land is not regulated, it often ends up being used for vehicular parking, significantly deteriorating the quality of the walking environment. The building footprint at road intersections is also established by the planning and zoning code, and also requires a setback that is frequently occupied by surface parking, degrading the street environment. When this sort of zoning drives the form of new development, the result is cities with extremely lifeless walking environments that are designed to be enjoyed from behind the wheel of a private car rather than from the perspective of the strolling pedestrian. The figure below shows the current plans for the new town planned around the Ji’an High Speed Rail station. Typical building setback, Ji'an, filled with parked cars. Intersection set-back provisions with set-back occupied by surface parking. The high speed railway development area is a sprawling planned development on what is currently agricultural land. The land is already being subdivided for roads and some developments are already taking place. If this development moves forward in this form and at this scale, it will result in a car-oriented and unappealing urban form that is unlikely to be very attractive to prospective residents and business tenants. Changes to setback requirements are therefore likely to benefit not only the BRT corridor, but also other new development areas of the city. Planned urban development around the Ji'an High Speed Rail station, in conformity with the Jiangxi zoning code's setback requirements, results in large setbacks and will create lifeless and car-oriented streets and transportation patterns. "Traditional arcade street protection, renewal and transformation should maintain the original historical style. The updated and renovated arcade should be parallel to the city road layout and keep the arcade building interface flush with the city road while ensuring uniformity and coordination between the individual buildings of the arcades, highlighting the continuous urban landscape of the arcade." As in the areas of mixed use, density, station area zoning, and off-street parking standards, Shenzhen provides a good model for Ji'an to emulate in the area of minimum setback requirements. Where the ground layer of the building can form part of a continuous commercial facade or shelter, the setback can be reduced to 3m. Shenzhen provides relatively modest setback requirement for buildings from the property line, with a maximum of 9 metres compared to the 15 metres stipulated in the Jiangxi Province codes, and a more flexible approach which takes into account the street frontage situation. Shenzhen does not stipulate any minimum setback between the edge of the vehicle or e-bike roadway and the edge of the property line. In the same situation of eight vehicle lanes of 3.5m plus a 4m e-bike lane and assuming a 3m walkway width which in Ji'an results in a minimum wall-to-wall building spacing of 106 metres, applying the Shenzhen standard would result in a wall-to-wall minimum spacing of only 65m. This reduction from 106m to 65m is a 39% saving in space, providing much more developable land potential for the city and creating the conditions for a more attractive and accessible walking and business environment. Ji’an is about to develop a world class Bus Rapid Transit system that could re-orient at least a part of the city to more transit, walking, and cycling-oriented lifestyles. Furthermore, Ji’an has a huge surplus of residential real estate. Occupancy rates are currently in the 20% range for newer developments, only about 50% for developments some 5 or more years old. It would be sensible for Ji’an to try and use their planning and zoning powers to encourage the developments immediately adjacent to the BRT corridor to become occupied first, as these new residences will be less likely to contribute to traffic congestion than if the automobile-dependent areas of the city become occupied first. The actions recommended below have the potential to make possible retrofits of some extant properties that should improve the chances that they will become occupied in the nearer term. We recommend that two new zoning overlay districts be created for the land within 550 meters of each planned BRT station, as follows: "Station Area – Urban Activity Centre" would be land along sections of the BRT corridor that are already developed with the characteristics of an urban street, or where the area is zoned for commercial. "Station-Area – Residential / Other" would be land along the BRT corridor which has already been built as single use residential or is currently zoned for residential. This special treatment of issues like density (FAR), mixed-use, parking, facades, setbacks and other topics applying especially to mass transit station areas would be consistent with the approach taken by many cities in China toward metro station area planning, though Ji'an's would be the first to be applied to BRT stations. Most or all measures required could be enacted as in other cities in China as part of the detailed zoning guidelines which the provincial zoning guideline requests the individual cities to prepare. A permissive approach will be taken to determining 'compatible uses' so that substantial mixing of land uses is allowed and encouraged in BRT station areas. (As discussed in part 2 of this series, mixing is currently allowed under the zoning guidelines, but is strongly discouraged by local officials). Retrofitting of ground floors within 550m of BRT stations with commercial activity is especially encouraged. Any property immediately adjacent to the BRT corridor (i.e., facing Jinggangshan Dadao, etc.) must provide a safe and shaded public walking path through the property every 200 metres, allowing all residents of the property and those from adjacent properties to conveniently reach BRT stations which tend to be located mid-block. Further, if the BRT station requires access to adjacent buildings, the property owner must provide an ‘easement’ providing direct public access to the BRT system. Property owners with properties facing the BRT corridor on Jinggangshan Dadao are allowed (but not required) to build commercial properties to the ‘red line’ (the property line) and are not required to provide any setback from the property line. Any such commercial property must have access and egress directly onto the BRT corridor, and at least 50% of the street façade must be made of transparent materials. Metal security gates are not allowed. Concept of allowing retail development in the large setback zone on the Ji'an BRT corridor. Small shop added to fill a gap in a streetfront in Brisbane, Australia. Narrow shop built in front of a car park to extend the street frontage in Bangkok (rear view and front view). These highrise buildings in Beijing's Chaoyang CBD area are mixed-use and built quite close to the red line, with minimal or no setback. The roadway includes walkway, segregated bike lane, greenery, and 4 traffic lanes, for a total wall-to-wall width of around 40m. 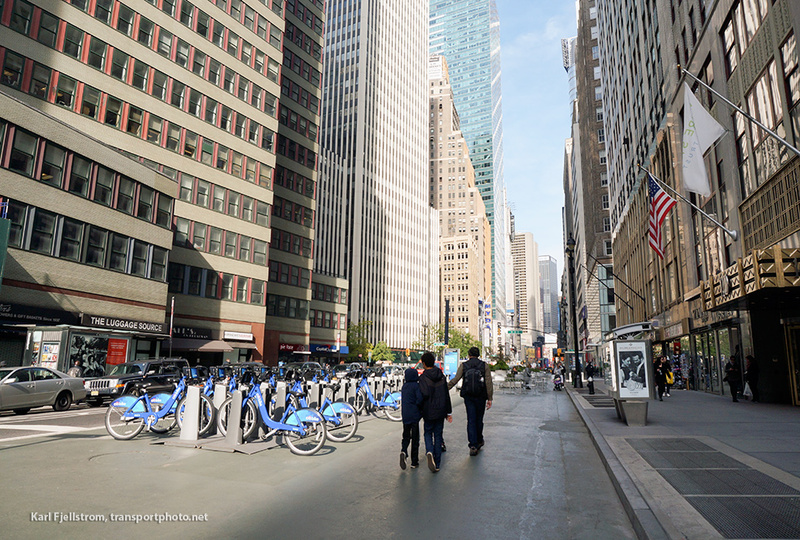 Continuous street frontage in New York City, including segregated bike lanes, mixed-use, high density, safe pedestrian crossings, and landscaping. Parking requirements for residential buildings should be a maximum of 50% of the required minimum for R2-zoned residential properties in the rest of the city. Parking lots in the development must be masked from view. The maximum allowable FAR should be approximately doubled, from the current 3.5 to around 7 or more. 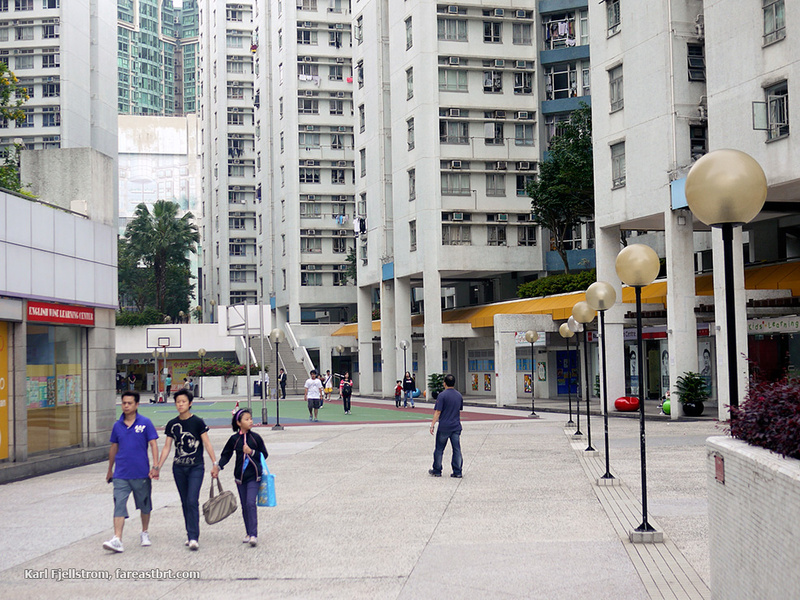 Currently, many single use residential properties in the station areas of the planned BRT corridor are largely vacant. Many of them have a large amount of surplus parking lying vacant. Some of this parking is blighting and makes the area less appealing to potential residents. This problem is common throughout China. However, in some cities the planning authorities have selectively allowed the owners of the buildings to convert the ground floor parking space to light retail uses such as convenience stores and coffee shops. Many people who own these properties do not actually live in the development and thus do not care about the quality of the environment. However, it is likely that an improvement in the environment on any one of these properties will provide a boost to the rental and/or resale value. Single-use residential development in Ji’an County in the BRT station area where ground floors are occupied by unused parking spaces covered in metal security gates. 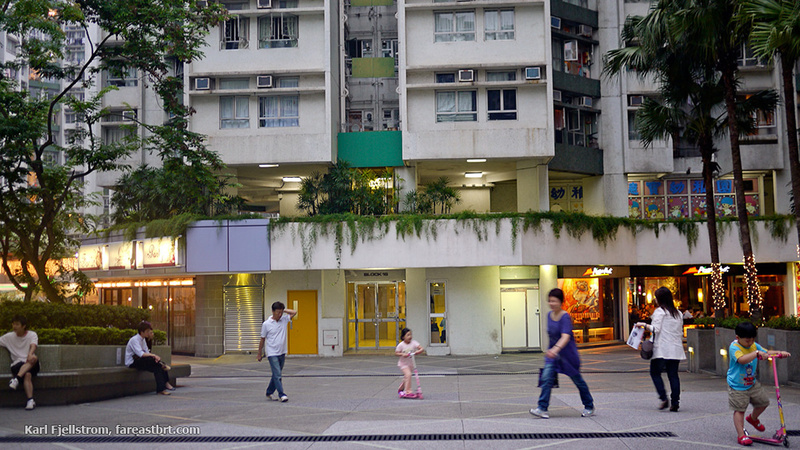 Ground floor shops in an older residential area in Whampoa Gardens, Hong Kong. 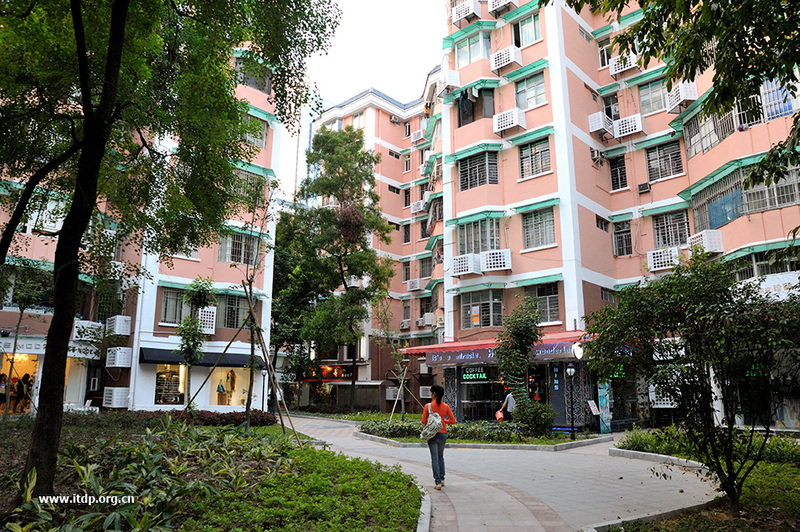 Ground floor shops in Liuyun Xiaoqu, Guangzhou, have revitalized a formerly residential-only area. In keeping with recent national government directives indicating that housing should be for people, not speculators, Ji’an could use the BRT residential station area zoning to help selectively revitalize some of its existing residential stock developed under outdated zoning and planning directives. Much of the land immediately adjacent to the BRT corridor in the areas considered as ‘urban activity centre’ is currently zoned for commercial. There is probably more commercial zoning in Ji’an than will ever fill with commercial activity, and as with residential real estate, there is a lot of commercial real estate lying vacant. Land zoned as commercial can be developed as any mixture of commercial, offices, public services (schools, parks, etc), and residential. Mixing of land use is encouraged. Commercial properties must be built up to the red line (the property line) to establish a continuous street wall. If any setback is required, it should be minimal, as in Shenzhen. Setbacks should be required only in the back of the property. No parking access or other vehicular access roads are permitted to cross the sidewalk on the BRT corridor. All parking facilities must be wrapped by at least 10 metres in depth of commercial land use. Parking minimums are abolished and replaced with parking maximums at 25% of the current commercial equivalent or residential equivalent land use. At least 50% of the street façade must be made of transparent materials. An access and egress point to the surrounding properties must be provided at a minimum of once every 50 metres. Multi-storey retail buildings immediately adjacent to a BRT station must provide a direct connection to any pedestrian walkway access to the BRT station. Lot coverage can be up to 80% of the lot. Maximum allowable FAR should be approximately doubled, from the current 5.5 to 10 or more. This series of articles on transit-oriented development in Ji'an in part 1 sets out the context and challenges for TOD in China, in part 2 provides recommendations based on best practices that could be implemented in Ji'an in the areas of density, mixed-use development and station area zoning, and in part 3 (this article) provides recommendations based on best practices that could be implemented in Ji'an in the areas of street networks, pedestrian realms, setbacks, and parking. All of these measures can be brought together as part of an approach to mass transit station area planning which has already been applied by several cities in China to metro station area zoning, and which is in line with best practice internationally and would allow the city to maximize the benefits from the BRT system investment. Ji'an would be the first city to apply this approach to BRT station areas. After initial application in BRT station areas, many of these improvements could be rolled out citywide, including in the large new development area around the high-speed railway station. 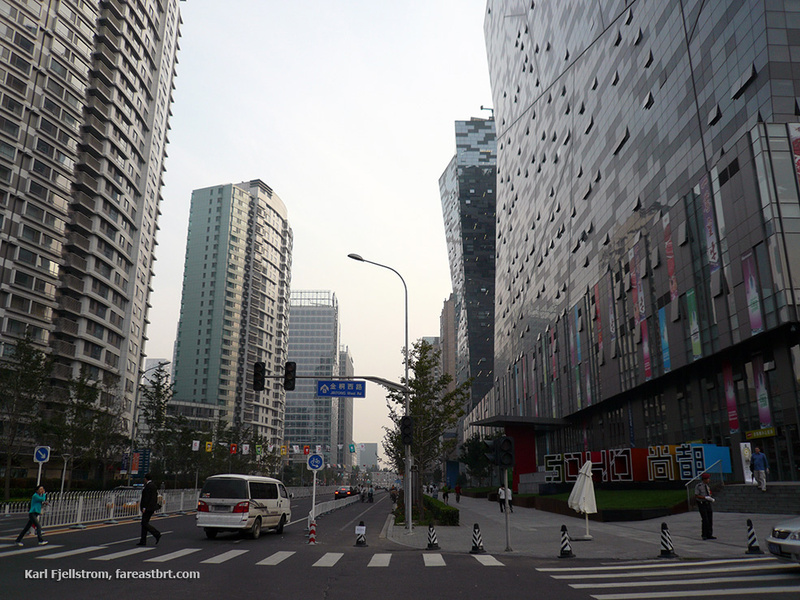 See part 2 on Ji'an TOD, covering station area zoning, mixed-use development, and density. Later articles related to TOD in Ji'an will document proposed parking improvements, including an on-street parking management zone in the central area, proposed pedestrian facility improvements in the central area, and a detailed case study of the outstanding Ru Lin Li mixed use development. The ongoing BRT project will also be featured when the key design features are finalized.